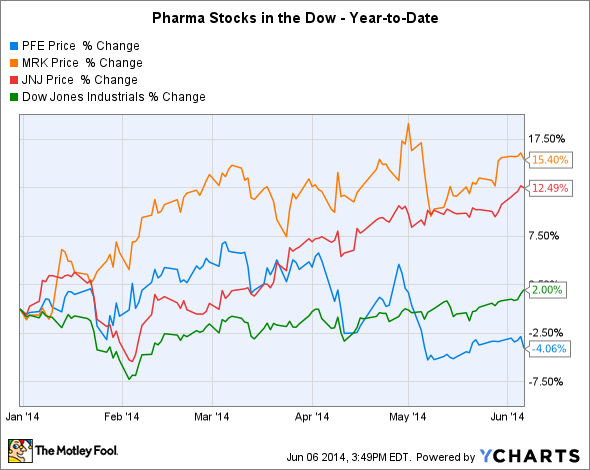 The Dow Sets Another Record, But Why Are Pharma Stocks Falling? The Dow Jones Industrials rose to new heights yet again, but Pfizer, Merck, and Johnson & Johnson missed out. The Dow Jones Industrials (DJINDICES:^DJI) set another all-time high on Friday, rising nearly 88 points and marking the eighth time the index has hit unprecedented levels this year. The catalyst for today's spike was the May employment report from the Labor Department, which showed a gain of 217,000 jobs and an unemployment rate that stayed at 6.3%. With many now concluding that the sluggishness in the employment market earlier this year was a seasonal aberration, investors hope growth will accelerate for the rest of 2014 and beyond. But within the Dow, stocks with exposure to the pharmaceutical industry, including Pfizer (NYSE:PFE), Merck (NYSE:MRK), and Johnson & Johnson (NYSE:JNJ), were all down today. Pharma stock data by YCharts. Both Merck and Johnson & Johnson have dramatically outperformed the Dow year to date, and Pfizer was holding its own until about a month ago, when it started doing worse than the broader market. Strong product launches and growth in existing-drug sales have helped power Johnson & Johnson's pharmaceutical division higher. With drugs including psoriasis treatment Stelara and hepatitis C therapy Olysio both putting in solid performance, prescription drugs have become a more important part of the the health-care conglomerate's overall success than in the past, with consumer products and medical devices starting to fade somewhat into the background. Similarly, Merck has done a good job of adding to its drug pipeline while also narrowing its focus on its highest-growth areas. Treatments for cancer and hepatitis C show a lot of promise, and Merck's $14 billion sale of its consumer care unit should help the company focus more on its prescription-drug segment. Yet today's declines appear to acknowledge the possibility that the Dow Jones Industrials' pharma stocks are seeing diminishing returns in their efforts. Pfizer's failure to complete the U.K. acquisition it so desperately wanted shows that corporate restructuring can only go so far. Even as Merck and other drugmakers consider selling or spinning off well-established legacy drug portfolios in order to give investors greater exposure to their higher-growth prospects, the question for pharma investors becomes whether Merck, Pfizer, and Johnson & Johnson will get riskier over time. With the Dow Jones Industrials at record highs, many investors are worried about taking on excessive risk at this point. A single day's declines in the Dow's pharma stocks is not worth worrying about. But if the pullback becomes a longer-term trend, you should take notice -- and keep your eyes open for future developments.